Picnic, this one single word fills our hearts with joy and happiness. This is such an exciting word that whenever uttered, it removes all the frustration, exhaustion and tiredness from our minds. From the very beginning of my life, I was always overjoyed with picnics and such gatherings. So in today’s busy life, a picnic is best way to counter your hectic routine waiting you ahead. Especially for the picnic, we make several arrangements. We make our favorite food, bring our desired beverages, and we select certain venue for the celebration. 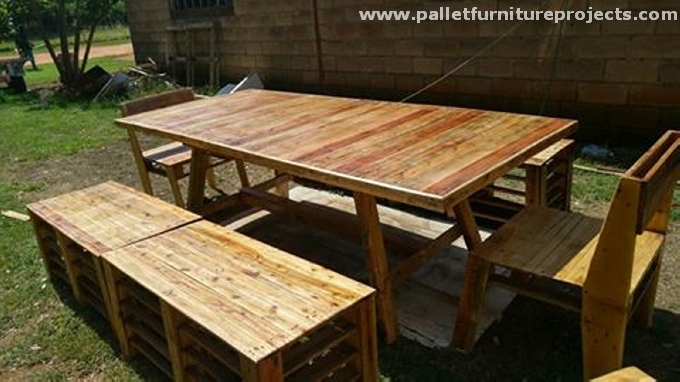 Here we have got specific furniture made with pallets for picnic. How exactly do you classify the furniture meant to be used in picnic? Well, it should be rustic, so that it is not affected by the extreme weather conditions. It should be light, so that we can easily place it on the selected place. It should be pretty spacious, and above all it should not cost us much. So keeping in view all these pre conditions, we are going to make a classic range of different furniture items especially for picnic, and they would be carrying all the above mentioned qualities in them, so just stay focused and grab this one for you next picnic plan. 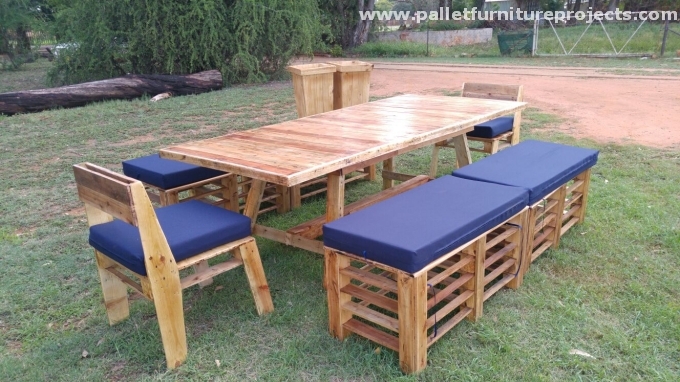 Have a closer look of this whole pallet wood furniture range made for special picnic day. There are two single chairs, which are pretty wide and spacious, even a bulky person can sit on it very easily. 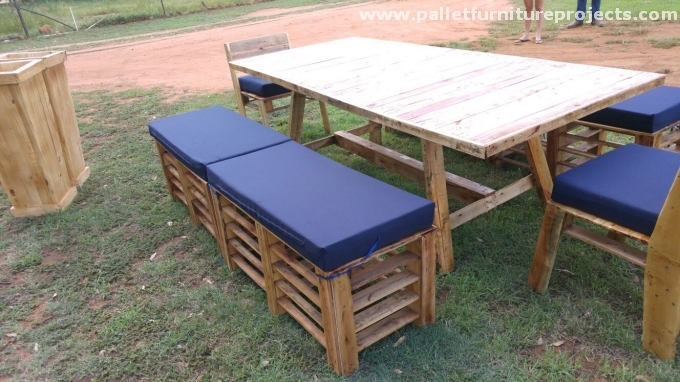 There are four pallet wood benches, they are the most casual wooden item we frequently see in indoor and outdoor like parks and public places. All of them are covered with luxurious mattresses covered in dark blue fabric. And in the middle, there is a large wooden dining table. So a complete set up for a perfect picnic celebration.